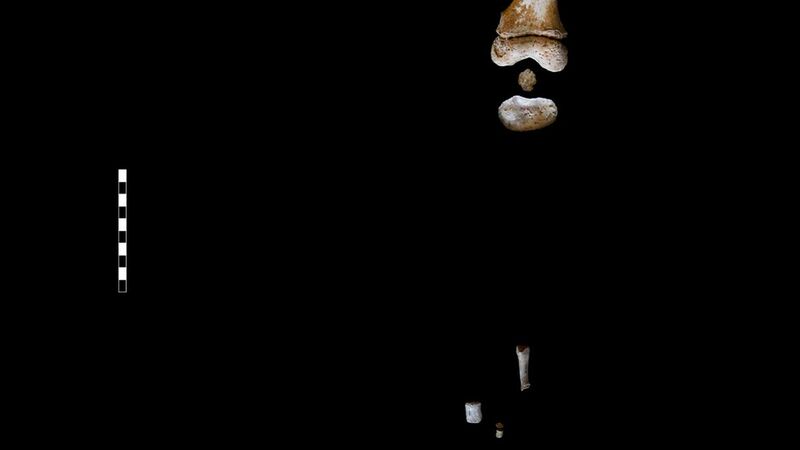 An analysis of a young fossilized Neanderthal reveals that their brains may have grown more slowly like humans, according to a study published Thursday in Science. The 7-year-old child's brain was 87.5% the size of an adult Neanderthal's brain, while 7-year-old humans' brains are about 95% the size of an adult's. This "fits with the generally held idea that Neanderthal's brains were bigger" than ours, writes Nicholas St. Fleur for the New York Times. That's because slow brain growth is associated with larger brain size. Why it matters: Young fossils are rare, but contain a wealth of information about how a species grew and developed. Neanderthals appear to be our closest cousins, so the more we understand our similarities and differences, the better we'll understand the earliest years of our species. And knowing that could help us learn why humans are still around, and Neanderthals are extinct. What they did: It's hard to tell how old a fossil is, because the obvious clues (like height) can be misleading (most believe a 5'3" tall Homo erectus called Turkana boy was 8 or 9 years old, but some argue he was as old as 15.) But scientists were able to age the Neanderthal child by counting the enamel layers on his teeth. Then, they analyzed the skeleton and used parts of the skull to estimate the size of the cranium and infer the size of the brain. But, but, but: This is just an analysis of one skeleton. There's a lot of variation in how fast humans grow up, and it's likely the same is true for Neanderthals. Some may have grown slower, and some may have grown faster. "Neanderthal brain growth may or may not be like any human population, but surely seems to fit within the normal human range," anthropologist Milford Wolpoff, who was not involved in the study, told The Guardian. What's next: The child's skeleton was uncovered in a cave with 12 other specimens, including its mother and a younger sibling. Researchers can learn a lot from related fossils and groups of fossils found together, because it helps show what traits are a part of variation within the species.